My very first website on the internet way back in 2001, I’d venture to say it’s comparable to being one of my children, I’ll always have it in my heart. An ever growing collection of creativity originally put together to release my own cross stitch designs and share my favorite hobby with the world. There is now an active Facebook community to compliment the crafty tools and free cross stitch patterns. Fast approaching 1,000 fans, we’re always learning something new together, sharing stitching tips and projects, inspiring new ideas within the group. 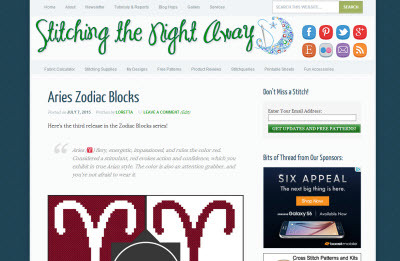 Tools and resources on the site include cross stitch supplies, tutorial articles, and a freshly released fabric calculator app for iPhone and Android to quickly and correctly calculate the size fabric you need for that next big cross stitch project. 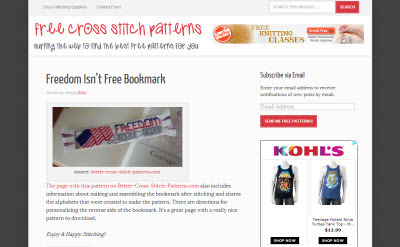 A growing collection of free cross stitch patterns from around the web.